Not all those who wander are lost. : We came. We saw. We ate pork. 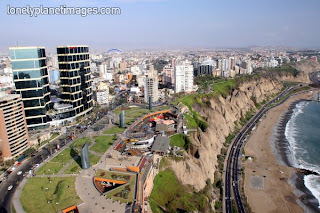 I had my heart set on visiting the Larcomar complex in Miraflores. Standing proud atop a cliff overlooking the beachfront, it promised a hip al fresco shopping, drinking and dining experience. I'd look at it longingly from the graffitied pier in Barranco while eating my $1.50 arroz con pollo. Lacking an aircraft from which to take a proper photo, I'll borrow one from google for your viewing pleasure. On Saturday, we decided to take the long beachside stroll to this mecca of gastronomic delights. We eagerly approached, and we're greeted by such culinary legends as Chili's and Tony Romas. Even the tradional TGI Friday's awaits! Hordes of fannypack adorned tourists poured from the Marriot across the street to take in the local Peruvian culture. We choose a seat at the least-expensive looking cafe, and shared a stale pork sandwich and two beers. Below us the ocean view stretched clear to Barranco and our previous lunchtime spot on the pier. Our bill could have fed every person on it arroz con pollo. Not only was the meal down below more delicious and budget friendly, but our ocean view wasn't obstructed by boisterous European tourists at the table beside us. Lesson learned.